Looking a little thin on top, Dallas. That is a statement I did not expect to make this season, but through my observations of staying up late to abuse my free NHL GameCentre Live preview, my opinion is that the Calgary Flames are the best team in Alberta. Perhaps one of the more interesting things I noticed during my watching was that of each coach's facial expression which can tell a lot about a team. 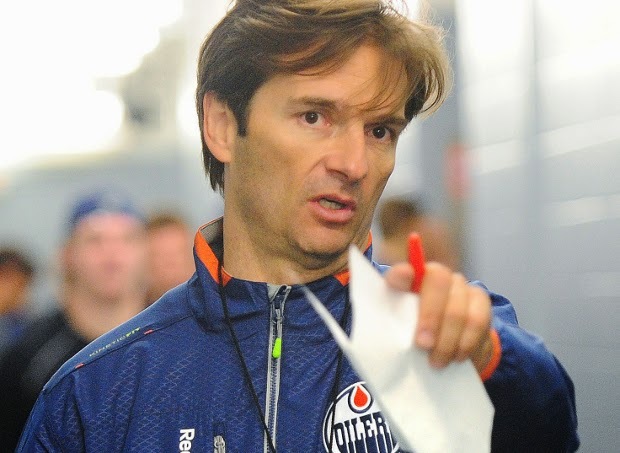 To the north in Edmonton, Dallas Eakins always looks pissed off and in disbelief that his defence can be that bad. He has some great hair and we worry about it going grey or worse - falling out. Down in Calgary, Bob Hartley looks awfully proud of how hard his team competes every night and sometimes you even catch him smile. So what is wrong in Oil Country? We may as well get this out of the way first, their defence simply shits the bed. With very little experience on the blue line, the Oilers are often caught out of position, making bad reads, or constantly sending multiple guys after the man with the puck. The signing of Andrew Ference was not a horrible acquisition, but expecting a career 5-6 guy to come in and be a regular top 4 may not have been the best idea. The same could be said for Justin Schultz who made an instant impact offensively in his rookie year, but continues to struggle defensively in his third season with the Oilers. The summer signings of Mark Fayne and Nikita Nikitin are a little too early to judge, but I can say that it’s a great thing Nikitin's overpaid contract is only two years. Let's hope rookie Darnell Nurse turns into the player he was projected to be and can stop the bleeding in a few years. Not a great penalty kill formation. In the crease, you have Ben Scrivens and Viktor Fasth, both backups in their careers who are now taking turns to see who can make the most saves in a given night. For the time being the duo will suffice, but like most great teams, a solidified #1 goalie will be needed eventually. The Oilers crease hasn't been stable for years with Devan Dubnyk the only Edmonton goaltender to record 20 wins since the 2009-10 season. It's hard not to be excited about the Oilers forwards with so many great young players in their line-up and that's why so many people expect Edmonton to do better, but at the end of the day they can't be expected to score 4 goals every night. The Fail For Nail campaign of 2012 has been a disaster as the young Russian struggles to find the back of the net with consistency and his lackluster defensive play is the only comparable to Alex Ovechkin. So what can be done to stop this oil spill? There are a few options to consider. First, management can stay the course by developing their young players, which likely means finishing at the bottom and being in the conversation of drafting Connor McDavid or Jack Eichel. The second option is that the Edmonton brass uses some of their assets in acquiring that stud defenceman every team covets and build out from the blueline instead of relying on their 1st overall pick forwards to simply outscore their opponents. Maybe a deal with a certain player on Nashville could be worked out? The Calgary Flames are quickly earning praise as the hardest working team in the NHL and there is a reason why they give out a hardhat after every victory. 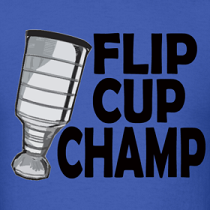 Without having that one guy with lethal offensive ability or that stud goalie they manage to come out with wins and can beat any team on any given night. Most notabe is their recent overtime win against the Chicago Blackhawks that ended with Jonas Hiller stopping 49 of 50 shots on goal. Unlike the Oilers, this Flames team has a better understanding to the concept of team defence which entails things like back checking, blocking shots, and man to man coverage in the defensive zone. Although they were badly outshot in the game against Chicago, it was these little things that ultimately made the difference in winning a close game. In 2013-2014, the Flames tied an NHL record of 49 1-goal games making it difficult for the opposition to earn points in the standings by sticking around in games. This season should be no different for various reasons. First, one of the bright spots of the Flames future is Sean Monahan. Fresh off a 22-goal rookie season, the young centre will continue to develop and learn with increased responsibility being put on him. The smallest player in the league, Johnny Gaudreau a.k.a Johnny Hockey will get an opportunity to contribute offensively with his elite playmaking skill, but will need time to adjust to the speed and size of the NHL game. With the loss of Mike Cammalleri and his 25-goal seasons to free agency, the Flames signed Mason Raymond to replace that lost offence for a few million dollars less. Not much has changed on the back end with the Norris-worthy Mark Giordano leading the way at both ends of the ice. His defence partner, T.J. Brodie, looks to have a bright future having signed a well-deserved contract extension this week and as long as they stay healthy the Giordano-Brodie pairing will be one of the best in the league. Without a doubt, the most important signing for the Flames during this rebuild stage is that of Jonas Hiller who can handle the workload, giving the players in front of him the confidence to go out and win games (if only by 1 goal). The first post-Kiprusoff season was a mess with four goalies combining for 34 wins and unlike the Oilers the Flames didn't waste any time finding a bonafide #1. Still without that explosive offensive ability that Edmonton may be capable of, the Flames are the better "team" and actually seem to have a front office making good hockey decisions now that Jay Feaster is gonezo. They might not be playoff bound, it's time to give Calgary credit as the best team in Alberta.